There's something enormously special about reading a book; being led into a world that you didn't know existed. Tempted by the words someone else has written and becoming completely and utterly enveloped in where the story is going to take you next. When my favourite books are developed into films, I become twitchy. I have already created my own image of the characters in my head and there is usually no way that all the details can be encaptured in the recommended length of a film. It can happen in reverse too. One of the best films ever is based on a book which I hunted down and was very disappointed in. But that is the nature of storytelling, isn't it? We all have different ways of presenting our ideas to our audience. None of my children have ever really read for pleasure. Not in the way I do, anyway. They learnt to read and write as normal, books were always made available to them along with library memberships and stories were read to them at night. But at no time did I ever find them lost in a book through choice. They preferred to be out playing, watching a film or, in more recent times, glued to something on the computer. And that's fine, of course. Jake was off school for a couple of days recently and became completely engrossed in the Harry Potter movie box set (thanks, Sky Movies!). He watched them all from start to finish, in order, twice. On Sunday he remembered that I had the full set in book version and asked me to rescue them from the spare bedroom. He settled down on the settee in the lounge and started reading The Philosopher's Stone. It took him longer than normal to read the first page and he had to clarify what a couple words said. 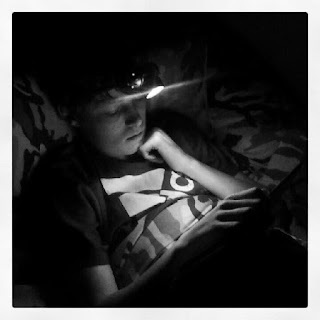 I'm fully aware than he has a lower than average reading age (some of that is down to his ADHD), but he's getting there. Later that evening I was about to go and find him to tell him it was time for bed (he's usually hiding in his older brother's bedroom, sneaking an extra game on the PS3) but Kev said he was already in bed, reading. I stifled a smug smile and left him to it. Yesterday, after tea, he went off to read again. He came down for some toast and said that he couldn't believe he'd been reading for twenty minutes because it felt like just five minutes. He also mentioned that he was enjoying reading the book because having watched the film helped him to picture what was happening in his head. He went to bed early again to continue reading, complete with head torch (probably so that he doesn't have to get up to switch the light out)! I can see that it's all starting to make sense. He's finally 'got' reading.